Cover-Up Alleged by Sister of UN's Louis Maxwell: Murdered in Kabul Wearing Shorts, Appearing to be a Taliban? My name is Aijalon and I am the sister of Louis Maxwell. First let me commend you on your diligent journalism regarding the facts into the true death of my brother. I truly feel that if this video was not made, we the family and the world would not know what really happened to my brother. I yes have seen the video because I needed to know what really happened to my brother. The last piece you did concerning my brother has truly made me even more angry and makes me believe that from the beginning it was the intentions of my brother's death not to be made public. All I can is wow. My brother Louis and Jay as we called him did what he was trained to do and that was to protect and serve this organization and defend it by any necessary means on that dreaded day. I truly hope that this same organization will defend his death the same way by any means necessary. Besides I have never heard of an insurgent (Taliban) wearing shorts which is what my brother had on. Mr. Matthew when we went to bed on October 27, 2009, our parents had a son I had a brother and my two nephews Malik Maxwell (age seven years old) and Nasir Maxwell (age eleven months old) had a father but when we awoke on October 28, 2009, I became our parents only child and my two nephews to were left fatherless. The UN has repeatedly said that it has been briefing the family of Louis Maxwell, has implied that Inner City Press should not keep inquiring into the irregularities of his death and the UN's subsequent actions, or requesting the actual Board of Inquiry report or even the names of those who prepared it. 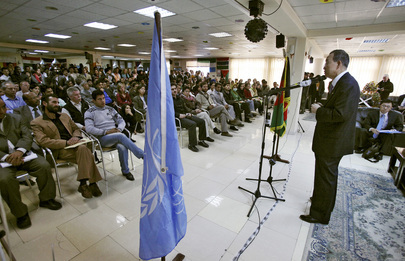 At a "World Press Freedom Day" event held at the UN on May 3, with the ironic theme of Freedom of Information, in the presence of UN spokesman Martin Nesirky, Inner City Press asked why the UN doesn't have a Freedom of Information requirement under which most or all reports like that on the death of UN staff member Louis Maxwell would be released. While the journalism professor the UN had invited to speak agreed such a policy is needed, none of the UN officials present, including the spokesman, responded as to the report. Watch this site. UNITED NATIONS, April 26 -- While denying it engaged in a cover up, the UN on Monday argued that its staff member Louis Maxwell, shown in a cell phone video being shot while standing next to Afghan National forces, was killed by bullet from long range, which the UN calls "friendly fire." While UN official Tony Banbury last week said on the record that Louis Maxwell as "murdered," to brief on Monday the UN produced Susana Malcorra, the head of the Department of Field Support. Inner City Press asked Ms. Malcorra why Mr. Banbury was not taking the questions, and whether the UN was retreating from his statement about "murder." Video here, from Minute 17:07. Ms. Malcorra said Banbury's word "murder" was "probably not the best word to have been used." All the more reason, then, to have Banbury come and answer questions about what many view as the UN's implausible explanation of Maxwell's death. Inner City Press last week sent Banbury -- and Ms. Malcorra -- a number of questions by e-mail, none of which have been answered. When Ms. Malcorra confirmed that the individual killed on the cell phone video was "absolutely" Louis Maxwell, she said the UN is conclude he was killed from long range. But he is surrounded by Afghan National forces, who do no flinch or even look up at Maxwell falls dead beside them. As numerous participants at Monday's press conference concluded, this makes no sense. The most diplomatic among them called it "implausible." What was presented, or rather summarized, on Monday was the UN's own Board of Inquiry's report. The text of the report was not provided. Nor when Inner City Press asked for the identifies of three of the Board's four members would Ms. Malcorra provide the names. This contrasts to the UN's recent report on the death of Benazir Bhutto in Pakistan, in which all three panel members were identified, and copies of the report provided to the press prior to the April 15 briefing. Some wonder, is a UN staff member less important? Or since it is a UN staff member, does the UN feel comfortable adopting less transparent procedures? Ms. Malcorra explained the anonymity of the Board of Inquiry's members as an attempt to "preserve their identities for the sake of future involvement in other matters, this or equivalent situations." But judges and police work on one case after another, with their names being known. 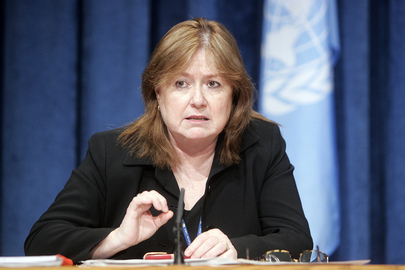 While Ms. Malcorra repeatedly called the Board "independent," it was headed by Andrew Hughes, who stopped being a paid UN staff member, at earliest, in September 2009. Hughes was paid as a consultant during the "investigation," and was on record in UN Police magazine while working for the UN has trying to build bridges and trust with the Afghan National forces. To some he seems a strange person to then purportedly independently investigate the Afghan National forces. Unlike Herald Munoz who headed the UN's Bhutto panel and answered questions, Mr. Hughes has not been made available. 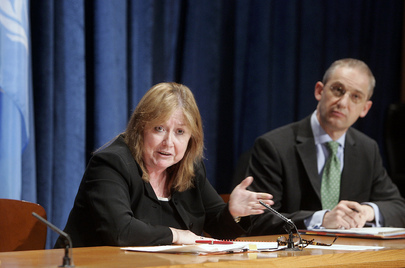 The other three members include two current UN system employees, and one "former staff" member. Can such a Board be called independent? Basic factual inconsistencies were not resolved by the Board of Inquiry. It was said, back in October, that the Afghan National forces did not arrive for 90 minutes, which is difficult to square with the account provided by Ms. Malcorra on Monday, essentially portraying Mr. Maxwell as being killed in the fog of war. The video shows no fire being exchanged, nor Mr. Maxwell's UN gun raised. Ms. Malcorra said the gun was "recovered" -- but from whom? Inner City Press asked when the UN because aware of and got the video footage. Ms. Malcorra said they became aware "sometime in January" and got a copy in late January. From the German Mission in Kabul? No. From whom? Ms. Malcorra wouldn't say. Inner City Press concluded with two overarching questions. The first involved allegations made to it by UN staff in Kabul that the UN, including Ban Ki-moon in particular, refused to raise this issue to the Afghan government, or to make it public since January. Ms. Malcorra's defense seemed to be "due process" -- that it would have been unfair to the Afghan government to say anything. But what about Louis Maxwell and his colleagues? What about the truth? The last question was, given both that at the time of the attack and deaths, there was tension because Hamid Karzai's government on the UN about electoral fraud, and that now Karzai is accusing the UN and other "outside forces" for being responsible for the fraud, and that the UN is reticent to criticize governments which threaten to throw it out or bristle like Sudan, how can this not be seen as a cover up. Ms. Malcorra replied that the Board was independent. But it was composed of two current and two former UN system staff. There is a need for an outside review, and fast. A well placed UN Security official who has watched the issue develop, including passing information to Inner City Press from people who knew Louis Maxwell, told Inner City Press on Monday, "Keep pushing this, a cover up in wrong, especially in this case." Watch this site.